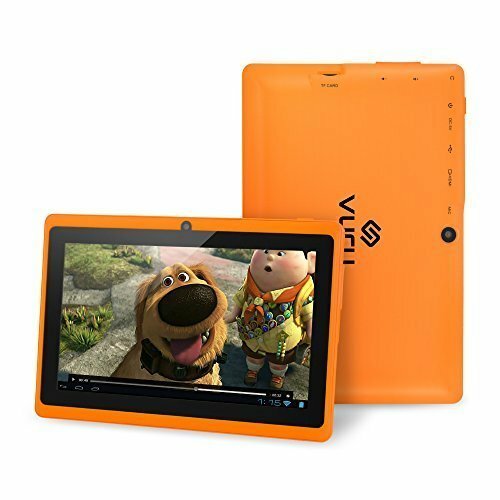 Color: Orange VURU Capacitive Touch Screen Tablet Android 4.4 1.2GHz 512MB 8GB Webcam WifiBluetooth Webcam: 1.3MP Front Camera / 2.0MP Rear Camera Wireless: Wifi 802.11b/g/n 3G: Supports External 3G Modem Sensor:Four-way G-sensor Support RAM: DDR3 512MB ROM: 8GB Speaker:8/1W Hi-Fi speaker Bluetooth Power Battery: 3200mAh Li-ion Battery Working Time: 3-4hours Power Device: AC Adapter Input 100/240V, Output DC5V Device Specifications Dimensions: 7 x 4 x .35 inches Net Weight: 11 Oz. Software Support: Office: Support MS Office Word, PPT, Excel Gaming: Built-in 3D Accelerator. Support 3D gaming Email: Gmail, POP3/SMTP/IMAP4 Multi-Media: Youtube, Flash Video: MP3,WMA,MP2,OGG,AAC,M4A,MA4,FLAC,APE,3GP,WAV etc. Audio: MP3, WMA, OGG, AAC, WAV FLAC etc. Picture: JPG, JPEG, GIF, BMP, PNG E-Book: TXT, EPUB, PDF,WORD,EXCEL, POWERPOINTS etc. Ports 1 x Mini USB 1 x TF Card Slot 1 x DC Jack 1 x Earphone Jack 1 x Mic What's in the box? 1 x Tablet PC 1 x Charger 1 x User's Manual 1 x Micro USB Cable 1 x USB (F) to Micro-USB (M) Adapter This is a Vuru Inc. branded product. Thanks for shopping with us.